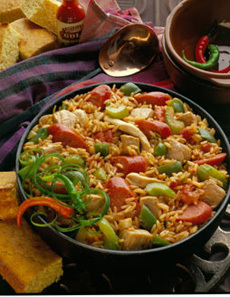 Jambalaya, a Cajun dish adapted from Spanish paella, uses long-grain white rice as a base for a topping of highly-seasoned seafood and meats. Photo courtesy of National Pork Board. This is Page 6 of a six-page article and glossary. Click on the black links below to visit other pages. without written permission. You are welcome to link to it. Medium-grain Persian rice, originally used by the Shahs of Persia. The rice is also called polow (a Persian word that is the origin of pilaf or it may be a spin on the Hindi word pilao). The quality of polow/pilaf dishes in Iran is vast. Look for recipes for traditional Persian sour cherry and parsley rice dishes. Polow is traditionally served at Iranian weddings. On very splendid occasions it is cooked with a caramelized sugar. Serve with stews, grilled meats, yogurt dips, herbs and cheese, breads and soups. 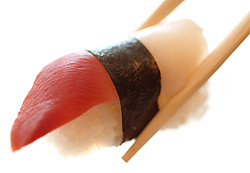 Refers to a type of medium-grain rice specifically used for sushi. Particular varieties like Calrose, grown in California and used at most U.S. sushi bars, and koshihikari, a premium medium-grain rice preferred in Japan, are two examples. Photo of surf clam sushi by Maria Gritcai | IST. Vialone nano is a “semifino” Italian rice from the Verona area of Italy. Its medium-large, semi-long, rounded grains are capable of absorbing twice their own weight in liquid, making it ideal for creamy risottos—when you’re looking for a soupy base and plump kernels. Cooking time is about 15 minutes, much faster than arborio and carnaroli (which makes the creamiest risotto, which are both designated “superfino,” or extra-fine. It is difficult to overcook vialone nano. The Consortium for the Protection of Vialone Nano Veronese was created in 1979, and the rice has an I.G.P. (Indicazione Geografica Protetta, or Protected Geographic Classification). Vialone Nano is a new rice, created in the 1930s, a hybrid of the Vialone strain; “nano” means dwarf. Riso venere (REE-zoe VEH-neh-reh) is a new rice variety, a medium-grain hybrid that has a naturally black pericarp (the outermost skin of the grain). In Italian, the name means “Venus rice.” The variety was created by Dr. Wang Xue Ren, a Chinese hybrid specialist. It is not genetically modified (that is, it is non-GMO) but a hybrid of forbidden rice (also called emperor’s rice), a species that grew in China for centuries and until the 1800 was cultivated only for the Emperor and his court. The Chinese cultivars were not adaptable to Europe’s cold winters, but the hybrid venere does very well. When cooked, the rice turns dark purple from the anthocyanins (flavonoids, a type of antioxidant) in the hull. The nutty, sweet taste adds to the appeal of the elegant color. 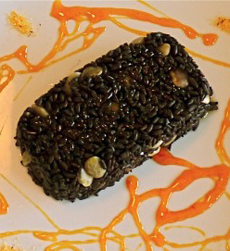 Riso venere, a black rice grown in Italy. Photo courtesy Tenuto Castello. You can buy riso venere online. Also known as sweet rice, the kernels are short and plump, and produce a thick, starchy product when cooked. Waxy rice is most often used as a binder for gravy, sauces or fillings. See also glutinous rice. Regular-milled white rice, often referred to as “white” or “polished” rice, is the most common form of rice. The outer husk is removed and the layers of bran are milled until the grain is white. While removing the bran and germ makes white rice more tender and delicate, it removes much of the nutrients as well. To compensate, converted rice uses a steam process to retain some of the nutrients. Wild rice is a member of the Poaceae family, genus Zizania; it is a cousin to true rice, the genus Oryza. Like Orzya, it grows in in shallow water. Instead of being cultivated, as the name indicates, it grows wild in small lakes and slow-flowing streams. There are four species of wild rice, three native to North America: Northern wild rice (Zizania palustris) from the Great Lakes region (it is the state grain of Minnesota), Wild rice (Zizania aquatica), which grows in the Saint Lawrence River and on the Atlantic and Gulf coasts; and Texas wild rice (Zizania texana), which grows along the San Marcos River in central Texas. The fourth species is native to China, Manchurian wild rice (Zizania latifolia, also called Zizania caduciflora). Products made with the whole kernel or grain, which consists of three components: the bran, endosperm and germ. The bran (outer layer) contains the largest amount of fiber, the endosperm (middle layer) contains mostly protein and carbohydrates along with small amounts of B vitamins, and the germ (inner part) is a rich source of trace minerals, unsaturated fats, B vitamins, antioxidants and phytochemicals. Determining what is and is not a whole grain can be confusing. For example, brown rice is a whole grain, but light brown rice is not. Read our overview of whole grains for what is a whole grain (including an informative list). 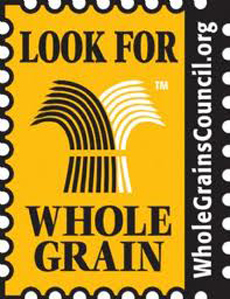 The Whole Grains Council offers an optional stamp to identify products that are whole grain. The logo of the Whole Grains Council. Rice: Origin, History, Technology, and Production, edited by C. Wayne Smith and Robert H. Dilday (2002). More than 650 pages of detailed information for industry professionals. Rice, Food In Focus, by Roz Denny (1998). For kids. Beautifully illustrated.